OK - not quite the response I was expecting, but well taken, thanks. Out of my ten sessions I've only seen another foiler once, so it may be a while before I find someone experienced who can try my gear. I'll try to clock up more sessions before getting the drill and epoxy out. Strapless water starts sound impossible to me at the moment despite having ridden mostly strapless surfboards for the last year or so. I have seen quite a few kiters learn to hydrofoil on this exact setup, so dont worry, it performs great - no drill needed! If I were you, I would mount the foil in the back holes (like you did in the photo), ditch the back foot hook and only use the front one. This way you will not have any problem water starting and you will have a free back foot, so you will be able to find a sweet spot when riding. Rear foot over the rear plate bolts is a good starting point, or even rear foot on top of the mast at the beginning. Thanks for the encouragement - I'll try that! Noob question. Been out about 10 times in very varied conditions and kites. RL variofoil with 70cm mast. In good conditions I'm foiling OK, but it feels like I need to keep all my weight on my back foot so not very relaxed. And toe-side foiling seems impossible at the moment (although the board is very easy to ride on the surface). I can move the base plate forward one whole base-plate length (i.e. there are 6 holes in all) but when I tried this once it seemed impossible to keep the board down. Just looking at the position of the front wing in relation to the front and back foot hooks I would expect it to be at around the mid point. So it looks to me like the ideal posiotion of the base plate would be about 1/2 a base-plate-length forward. Does this make sense? I confirmed with the guy who makes them that one can redrill in the usual way, but should I wait a bit until I have more experience and I am foiling at higher speeds? After having looked at your picture I have found your problem. If you are using the back foothook in that position with the foil in the forward position, you are too far back with your feet. Either don't use the foothooks, or move them forward about 8-10 cm. That should balance the foil. I would also recommend just using the front foot hook. No need for the back hook when learning. When up and riding pay a lot of attention to where your back foot is. When I was learning I put masking tape on the rails of my board so that I had a quick visual reference for my rear foot location. Kind of like frets on a guitar. This....back foot free and starting directly over the mast. Once you have 20-30 hours of riding the wing legit, you can play with balance. Once your brain knows what to do on its own, a move of even half an inch makes a huge difference....hell even where you position your head fore and aft makes a difference on center of gravity. I 100% agree to get rid of rear foothook. Started with front footstrap, then front hook. The ability to move(wiggle!) your foot around is a game changer. Broke the hook and had to learn to waterstart "strapless, little tricky but since I was 1/2 mile off shore gave me a little extra incentive. Put in more time, its you, not the equipment! 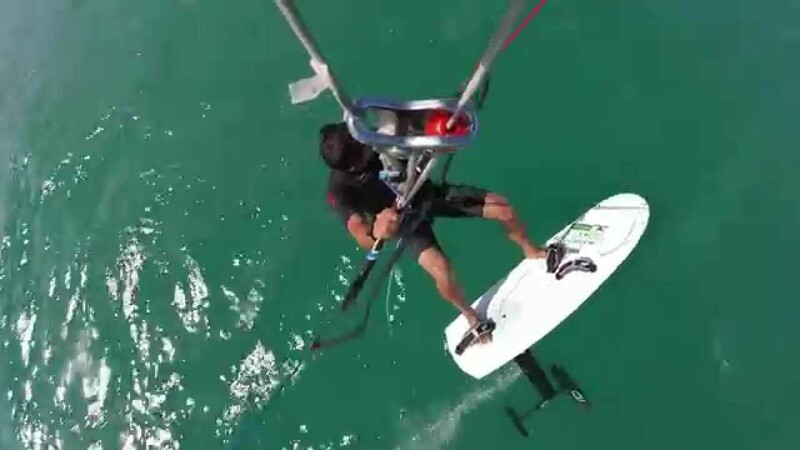 If you want to ride strapless but have an easier time waterstarting just mount the hook enough forward so when you are foiling its just a little forward of where your foot will be when on the foil. Or mount a loop of webbing that you can use to waterstart, then it will be out of the way while riding. I thought (as per the videos) that I would need to shim between the fuselage and the mast. But between fuselage and stab - that should not be difficult to try. I didn't find a video explaining that but I can probably work it out. If you have a foil that has a mast/fuse connection like a Delta or Spotz Tuna, you can shim that junction, but you can also just put a thin piece of plastic between the stab and the fuselage and get a similar result by changing the angle of attack. This corrects the front foot/rear foot pressure relationship you originally complained about. The shim at the fuse/mast area moves the lifting force about the strut axis relative to the rider position on the board, the shim under the stab moves the lifting force about the fuselage relative to the front wing, so you're accomplishing similar goals through different moment arms. Anyway, just play around with a little piece of cut up milk jug or a hotel room key, those are the two materials I've used successfully to make shims for my foils. When I first got my Sword2, this modification made ALL the difference in being able to ride around easily at a stable ride height. the foot placement is very simple. Don't look at the mast, look at the wing. Typically the wing is about a foot or so in front of the mast. You want your body to be exactly above the wing (it's ok to be an inch or cm off but try to get close as possible), with your rear foot however many cm or inches behind the wing and your front foot the exact amount of inches or cm in front of the wing. So it's very simple. Find exactly where the wing is and measure everything. If it turns out that your wing/mast/foot clips, whatever you have, if it's not close to equal in front of the wing and behind the wing (the wing remember not the mast not the board, just the wing), then you want to drill some new holes. If you do a professional job drilling holes it should not hurt resale value too much. Find exactly where the wing is and measure everything. If it turns out that your wing/mast/foot clips, whatever you have, if it's not close to equal in front of the wing and behind the wing (the wing remember not the mast not the board, just the wing), then you want to drill some new holes. If you do a professional job drilling holes it should not hurt resale value too much. Right, this is exactly what I was trying to show in my original photo. The wing is placed in the photo in the position that it sits relative to the board. The mid point between the straps is marked with a dot at 35cm. So to my thinking the position is not right and would explain why it feels like I have 80% weight of my rear foot when foiling. The alternative mast position option that I have would be just as unbalanced but towards the front foot. But I will try removing the rear foot hook for starters. That should give me the extra leverage that I need to get a better balance. (Shimming the stab does not look like an option after all due to the design).